believe it originates from The Stanford Mathematics Problem Book, though I've seen it elsewhere in other forms. Well for me Etoys is the tool of choice (not perfect, could be better, but a great choice). Etoys is an educational tool for teaching children powerful ideas in compelling ways and a media-rich authoring environment and visual programming system for kids to create. Besides logo like programming it hashas GeoGebra like functionality built in with DrGeo. But for this problem you don't even need Dr. Geo. Below are the simple steps for kids to create a model of the problem. 1) Create a "Square" using the rectangle object. Below is a screen shot where I added one variable and a simple two line script. 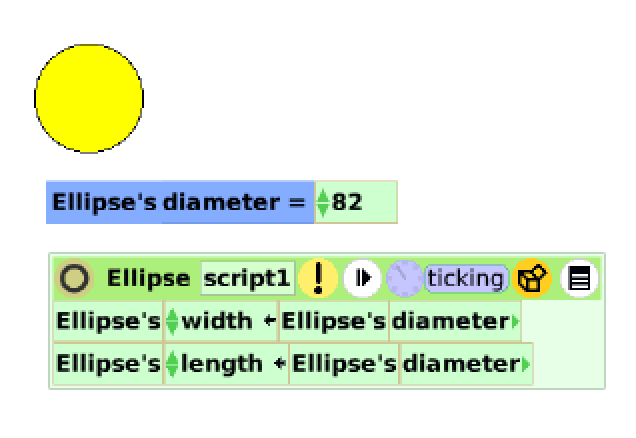 2) Create a "Circle" using the Ellipse Object. Below is a screen shot again adding one variable and a simple two line script. 3) Now we need to create the line segment and showing the different segments. 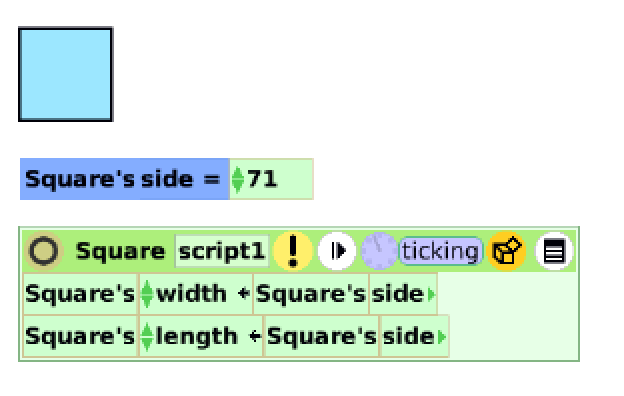 Below is a screen shot of two Rectangle Objects and three simple scripts. Two to have the widths match the square's side and the circle's diameter and one to keep them aligned.